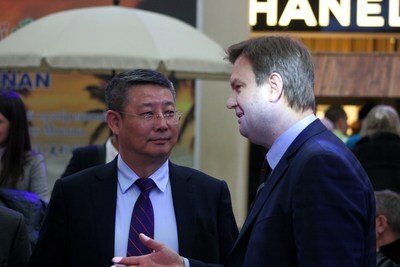 MOSCOW, March 12, 2019 /PRNewswire/ -- On March 8, the Sanya Tourism, Culture, Radio, Television and Sports Bureau sent a tourism promotion delegation to attend Intourmarket-2019, the international travel fair taking place in Moscow from March 9-11. At the event the delegation talked about Sanya's many advantages as a holiday and tourism destination, citing the visa-free access for travelers from 59 countries and the 11 non-stop air services between Russia and Sanya. The delegation included performers who put on a singing and dancing performance that borrowed heavily from the traditions of the Li and Miao, two ethnic groups that are the original inhabitants of Sanya and its immediate area. The Sanya Tourism, Culture, Radio, Television and Sports Bureau held a roadshow event in Moscow, Russia's major tourist source market, by promoting the visa-free policy, the non-stop air services and the unique tropical seaside vacation offerings, in a move to attract more Russian tourists. Deputy Director of the Sanya Tourism, Culture, Radio, Television and Sports Bureau Cao Yuanxin, Director of China National Tourist Office in Moscow Wang Xiaoxia, Director of Moscow Tourism Bureau's tourism and hospitality management department Aleksei Tih! nenko and Sanya Tourism, Culture, Radio, Television and Sports Bureau travel industry analyst Tang Sixian were present at the event. A performance ofÂ a traditional dance,Â a Li nationality danceÂ andÂ bamboo dances in which the audience was invited to join, coupled with the handing out of special gifts made of shells found on the beaches of Sanya, among other programs that demonstrated the city's unique characteristics, were staged at Moscow's Staropetrovsky Atrium Business Center. Sanya, located at a comfortably tropical 18 degrees north latitude, extended a sincere invitation to Moscow's citizenry by offering them an opportunity to learn about Hainan's unique culture, its new visa-free policy and Sanya's new tourism format amid the establishment of the Hainan Free Trade Area. Mr. Cao said, Hainan, which is establishing a free trade pilot area with plans, if the pilot area is successful, of expanding into a full-fledged free trade port with Chinese characteristics, has set its mission: becoming the world's most popular overseas destination for Russian tourists. The Sanya and Russian tourism authorities have established an exchanges and cooperation mechanism to enhance the ability to ensure the safety of Russian travelers and create a more friendly and safer environment for them. Sanya has also rolled out a series of tourism offerings oriented towards the expectations of Russian tourists, including the world-renowned Atlantis Sanya luxury resort, Haichang Fantasy Town, multiple hot springs and traditional Chinese medicine-based physical therapy services. By improving Russian signage in and around Sanya and providing Russian menus at some hotels, Hainan will become a leisure destination that offers Russian tourists a sense of belonging. In 2018, 204,000 Russian tourists visited Sanya, making Russia the largest source of inbound tourists to the city. Sanya offers 11 non-stop air services to cities across Russia, including Ekaterinburg, Irkutsk, Kazan, Khabarovsk, Krasnoyarsk, Moscow, Novosibirsk, Ufa, Ulan-Ude, Vladivostok and Zhukovsky, adding up to 19 flights per week and making the trip to Sanya a convenient experience no matter where one lives in the expansive country. Fourteen Sanya-based travel agencies attended the tourism promotion event in Russia. Sanya's municipal government and leading business in the travel sector worked hand-in-hand to analyze Sanya's traditional inbound tourist source market and improve the quantity and quality of Russian inbound tourists.